← Free eBook: Impacting Your Workplace! 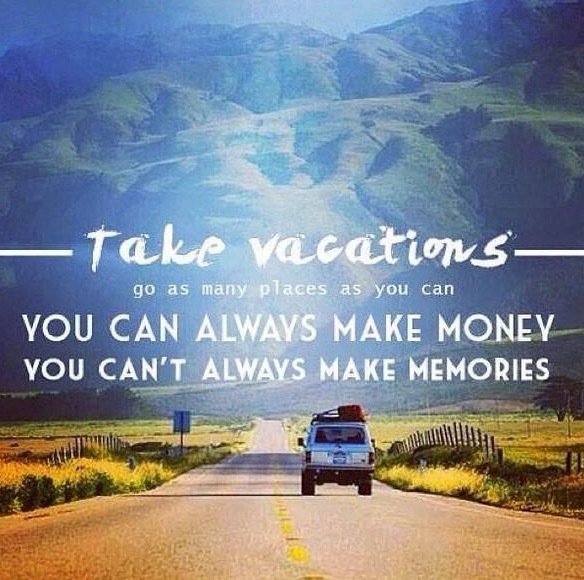 Vacations and Life Experiences: Cash or Credit? Several years ago in one of my graduate classes, the professor had us fill out a “getting to know you” sheet. One of the prompts read: “Fondest memories as a child _______.” After a short while, the class shared their results. Approximately 99% of the class shared their fondest memory was taking trips in the car as a family. Of course, we all complained about the lack of quality (or no) AC, annoying siblings, endless hours in the vehicle staring at desolate landscapes, and various unpleasant odors that accompanied the trips. However, despite having no smart phones or tablets, videos, or MP3 players (I’m really dating myself) – we all agreed those were the most cherished parts of growing up. The destinations, of course – but also the journey there: Stopping at hole-in-the-wall cafes/dives, using our creativity to invent games , spotting license plates from other states (still can’t believe we saw Hawaii one time), and praying feverishly that the hotel had anything that resembled a swimming pool. Fast-forward to the present day. As we occasionally reflect and discuss our favorite memories as a family – the majority of conversations hover around vacations, the experiences we’ve encountered, the “unique” individuals that crossed our paths (usually resulting in deep belly laughter), and the eager anticipation for our next trip. However, most of these memories come at a price beyond the trip. Confession time (gulp). Like the typical American consumer featured in some statistical chart somewhere – many of our trips have been funded by credit cards. I would love to live on cash only as many books, seminars, and financial experts proclaim. Excuse time: Our vehicles break down, teenagers eat a lot, medical expenses, holidays and birthdays, outdated appliances stop working, one of us always needs some type of new clothing, home repairs, college is on the horizon, did I mention teenagers eat a lot? 🙂 I know, it’s called Life. 5 Responses to Vacations and Life Experiences: Cash or Credit? I must admit, I am guilty of using credit to fund vacations in the past. And, they have been amazing! That said, we have lived in Europe for the past 4 years and taken so many amazing trips, but have done it solely on a cash basis because we did not have credit available to us here. It can be done. We plan far in advance and schedule parts at different times. We often begin with booking lodging, then travel and save for spending costs. We also schedule excursions in stages. I never thought it could be done, but we have managed to do it! We will pay off all of our debt in the next two months, and vow not to get into debt again. If you use credit, pay it off the next month! Great insight Andrea! Still can’t believe you live in Europe – we had such a blast there! This is a very complex subject, but having had financial problems, we have abandoned credit cards completely. On the other hand, we have experienced God’s promise to “throw open the floodgates of heaven”. I always remind myself of what Jesus said in Matthew 6:33. I am thankful for God’s provision, but try and remind myself that God provides for what we need, not what we desire. You have done a great job as a father, Dave. God bless you. Thanks Tony! Good for you getting rid of credit cards!